There is no documentary record of the first contact between Labrador Inuit and Europeans. The explorers, fishermen, and whalers who visited Labrador in the first half of the sixteenth century made no mention of people who can be positively identified as Inuit. However, by the turn of the century, there are indications of encounters between Inuit and Europeans that were, for the most part, hostile in nature. Typical of this period was the massacre of two members from the explorer John Knight's expedition, who were killed by Inuit when they went ashore on the central coast of Labrador in 1606. Most of the bloody encounters of this period took place in southern Labrador, where shore stations of the French and Spanish “dry fishery” were concentrated. These stations, abandoned during the long winter season, provided the Inuit with a ready source of boats and equipment, including iron nails, which could easily be obtained by setting fire to the fish stages. When European fishermen returned to Labrador the following summer, they took their revenge by attacking any Inuit who happened to come near. In spite of the cycle of bloodshed and retaliation that characterized most early contacts between Labrador Inuit and Europeans, there are some accounts of peaceful trade relations toward the end of the 17th century. For example, when the explorers Pierre-Esprit Radisson and Médard Chouart des Groseilliers were sailing from New France to Hudson Bay in 1683 they purchased sealskins from Inuit they encountered in the Nain-Okak region. Similarly, when Louis Jolliet explored the Labrador coast as far north as Zoar, near Nain, in 1694, he purchased seals and animal oil from several Inuit. By this time, the Inuit possessed many articles of European manufacture, including wooden boats with sails and grapnels, barrels, sea chests, screws and nails, knives, cloth and various items of European clothing. Some of the European goods were of Spanish origin, but Jolliet did not know whether they had been obtained by trade or plunder. He thought that the Inuit did not yet have regular trade contacts, but that they only traded with fishing ships when the opportunity arose. The early 18th century saw an expansion of French activity in southeastern Labrador, with rapid development of shore-based (sedentary) seal and cod fisheries. The seal fishery was conducted by Canadian grantees who were supplied by Quebec merchants and kept their posts open throughout the year; the cod fishery was pursued by ships that arrived from France each June and returned in September. Although hostilities remained common for several decades, sealers and cod fishermen engaged in sporadic trade with groups of Inuit who made summer excursions into the Strait of Belle Isle and to northern Newfoundland, where they ventured as far south as Port au Choix. Evidence suggests that most of the Inuit who frequented the posts and fishing harbours of southern Labrador during this period were summer visitors who returned to their winter homes in the north. For example, in 1705 Augustin le Gardeur de Courtemanche, a Canadian grantee who held the title Commander of Labrador, specified in his report on the “Eskimo coast” that the Inuit resided in Kesesakiou (Hamilton Inlet). The same report suggests that some Inuit had wintered a few years earlier in Baie d'Haha on the north shore of the Gulf of St. Lawrence, indicating that temporary winter residence may have occurred west of the Strait of Belle Isle from time to time. Trade relations became even more regular after 1743, when Louis Fornel explored Hamilton Inlet and left two men to establish a trading post at North West River. By this time, a major trade staple supplied by the Inuit was baleen, long flexible strainers from the mouth of the Greenland whale, which were used in Europe to make brushes and corsets and were then bringing high prices on the world market. Most of the baleen came from northern Labrador and was carried to Hamilton Inlet by Inuit middlemen, who had already developed a trade patois for dealing with the French fishermen in southern Labrador. One of the most commonly heard phrases was “troquo balena,” from French troquons “let's trade” and baleine “whale, baleen.” Although rudimentary communication was now possible, the French remained cautious; it was said that they always traded with a guard of several armed men, and as soon as trading was finished they sent the Inuit away. Relations between Europeans and Inuit were temporarily disrupted in 1763 when Labrador became a British possession and the French were no longer allowed on the coast. The disruption was attributed partly to the inexperience of the British and Americans who attempted to take over the lucrative baleen trade. The governor of Newfoundland, Sir Hugh Palliser, tried to end hostilities by negotiating a peace agreement with some of the Inuit in 1765. Although Palliser's truce did not immediately eliminate misunderstanding and bloodshed, it smoothed the way for an expansion of European activity and settlement along the coast of Labrador. European settlers concentrated in the area south of Hamilton Inlet, where they were frequently visited by travelling Inuit whose regular homes lay farther to the north. At this time, the Inuit population of the entire coast was about 1,500. Courtesy of Hans Rollmann. From a lithographic reproduction by Leopold Kraatz, Berlin. Original drawing by Moravian bishop Levin Theodor Reichel (1812-1878). 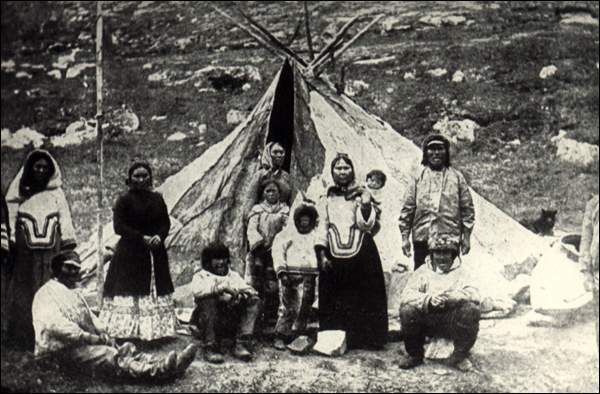 The most significant changes to Inuit culture in the early British period resulted from the presence of Moravian missionaries, who were the first non-natives to settle north of Hamilton Inlet when they established a station at Nain in 1771. When they arrived in Labrador, the Moravians, members of a Protestant sect that traces its origins in Europe back to 1457, had already been active in other countries, including Greenland, where they had learned the Inuktitut language. Their Labrador operations expanded with the founding of Okak (1776), Hopedale (1782), Hebron (1830), Zoar (1865), Ramah (1871), Makkovik (1895) and Killinek (1904). Although the main concern of the early Moravians was the spreading of Christianity, they were involved in many aspects of Inuit life other than religion. To the Inuit, who had come to depend on a wide variety of European goods, an extremely important feature of the mission station was the Moravian-operated trading store. 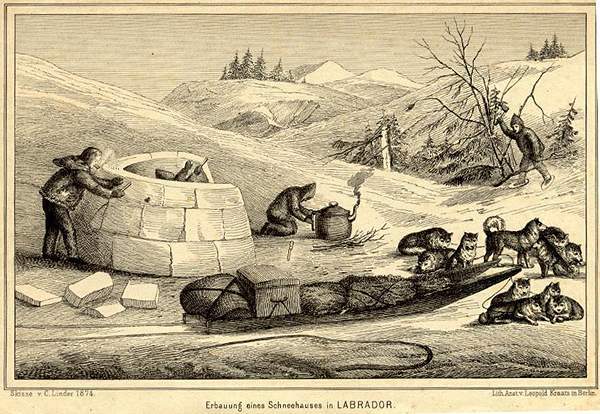 By maintaining regular trade with the Inuit, the Moravians hoped to make their mission as self-sufficient as possible while reducing the number of Inuit journeys to European traders in southern Labrador. Reproduced by permission of Dr. James Hiller, Memorial University of Newfoundland, St. John's, NL. Photo©1961. The relative isolation of the Moravian mission stations ended in the 1860s, when Newfoundland cod fishermen started frequenting the northern coast of Labrador in greater numbers than ever before. One writer, who visited Labrador twice in the late 19th century, estimated that approximately 30,000 fishermen in 1,000-1,200 vessels arrived on the Labrador coast between late June and early October. These “floater” fishermen frequently traded with the Inuit at their summer fishing camps away from the mission,and the Inuit acquired novel trade goods, alcohol and European food. They also contracted new diseases, which, combined with dietary change, contributed to a decline in the Inuit population. Courtesy of the Centre for Newfoundland Studies (Hettasch Collection), Queen Elizabeth II Library, Memorial University of Newfoundland, St. John's, NL. The Moravians ceased trading with the Inuit in 1926 when, after several years of financial difficulty, the mission transferred all its trading operations to the Hudson's Bay Company. Although the HBC had been operating on the coast of Labrador since the mid-19thcentury, most of its earlier trade had been with settlers and Innu. 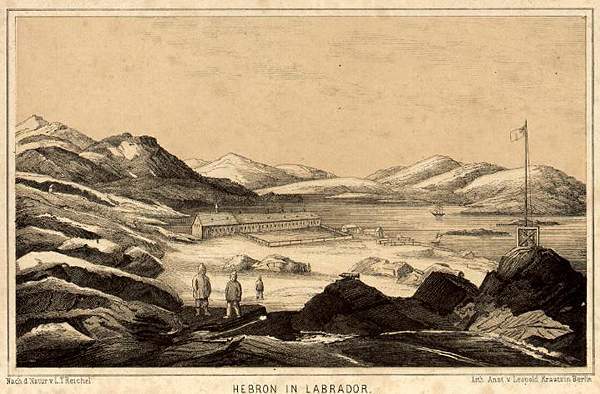 Direct competition with the Moravians had increased when the company opened northern posts at Saglek (Lamson Fort) and Nachvak in 1867 and 1868; however, it was not until the Moravians gave up their trade operations in 1926 that the company achieved significant control over the Inuit economy. Courtesy of Hans Rollmann. From a lithographic reproduction by Leopold Kraatz, Berlin. Sketch by trade inspector Carl Linder (1833-1898). Shortly after the Hudson's Bay Company had begun to exploit its new trade monopoly, the Newfoundland government also started to take over functions once handled by the Moravians. In 1934 the Commission of Government established a rural police force, which posted members of the Newfoundland Rangers in several Labrador communities. One function of the Rangers, who found very little crime to contend with, was to issue government relief during the Depression years. Newfoundland began to take a more active role in the lives of the Labrador Inuit in 1942, when the Hudson's Bay Company, plagued by rising expenses and trade deficits, closed all its establishments in northern Labrador. These were taken over by the Newfoundland Department of Natural Resources, which put all responsibility for trade in the hands of its newly organized North Labrador Trading Operations. At the same time the Newfoundland Railway started to operate a regular supply vessel on the Labrador coast, formerly a service of the Hudson's Bay Company. 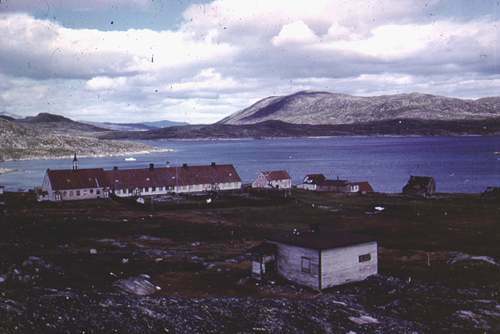 After Newfoundland entered confederation with Canada in 1949, many of the services the Moravian mission had provided for the Inuit were taken over by provincial and federal government agencies. An example was formal education, which had been available in mission schools since the late 18th century. One lasting achievement of the Moravian schools was the introduction and promotion of literacy in the Inuit language, using an orthography based on Roman letters and developed by the missionaries. When the provincial government first took over the task of education from the Moravians, English became the language of instruction. More recently, there have been successful efforts to include the Inuit language, Inuktitut, as part of the curriculum in several Labrador communities. The Newfoundland government also took over responsibility for Inuit health care. 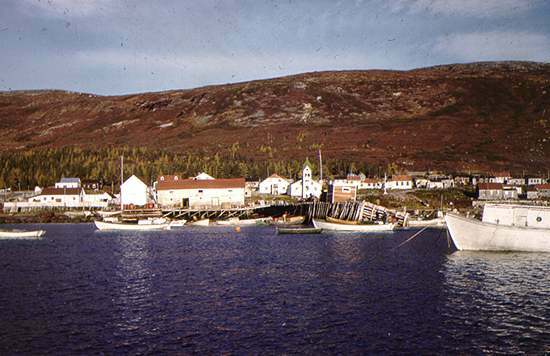 The Moravians had provided medical assistance from the time of their first arrival in Labrador and had founded the first hospital in northern Labrador, built at Okak in 1903. From the early 20th century, the Moravians were aided by medical personnel employed by the Grenfell Mission, later the International Grenfell Association, and by government doctors who traveled on the summer mail boat. In recent decades, clinics and cottage hospitals have been established in several Labrador communities and a resident physician has been posted to Nain, which, since the relocation of people from Hebron and Nutak in the late 1950s, remains the most northerly community on the coast. Reproduced by permission of Dr. James Hiller, Memorial University of Newfoundland, St. John's, NL. Photo ©1961. The intensity of contact with the outside world that has resulted from modern developments in communications technology has created new pressures on Inuit cultural traditions. In recent years, the Labrador Inuit have taken several significant steps to protect their language and culture from outside forces. One of the most important was the establishment in 1973 of the Labrador Inuit Association, which has sought to further the interests of all Inuit residing in the province in matters such as hunting and education, and which negotiated a land claims agreement with the Crown in 1999. For other related articles view the Aboriginal Peoples Table of Contents Inuit section.